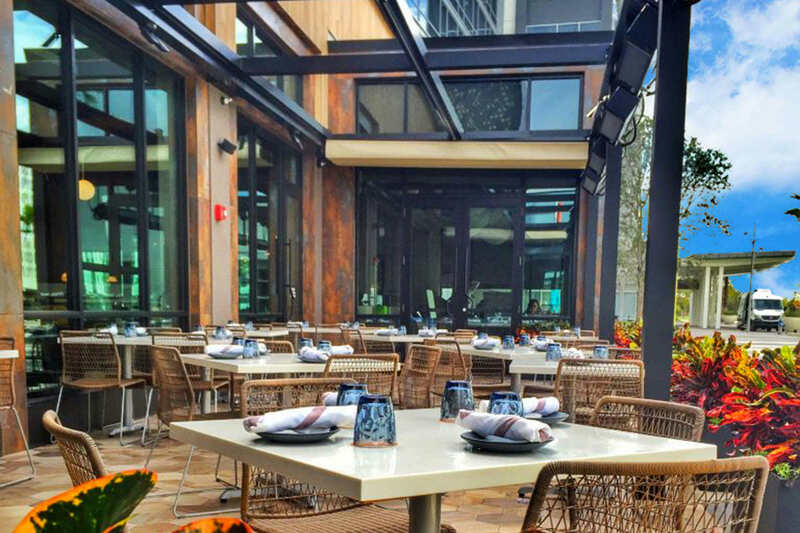 A short trip south from the Orlando airport and less than an afternoon drive from the glitz and glamour of Miami Beach is the small town of Lake Nona, home to Chroma Modern Bar + Kitchen. Serving guests a ‘modern American menu’ with ‘scratch-made dishes’, the entire concept, created by Tavistock Restaurant Collection, has a cosmopolitan flair with a small-town sensibility. 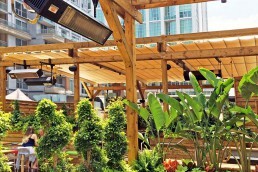 At nearly 8,000 sq. 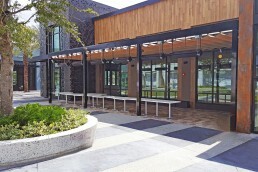 ft., the stand-alone building boasts 256 seats that include an outdoor lounge, solarium and covered patio. 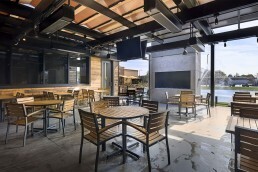 The stunning outdoor space offers guests the opportunity to dine while enjoying lakeside views and the perfect sunsets. 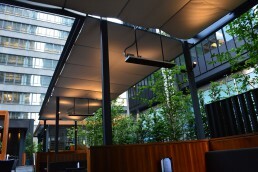 In order to fulfill the expectations of all the guests, the outdoor space required protective coverage that would ensure comfort at any time. 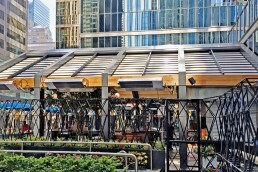 Two 24’x14′-motorized canopies cover the 600 square foot patio. 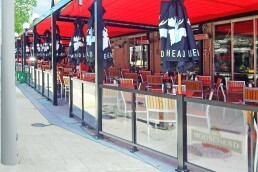 Waterproof fabric and a slight tilt on the canopies manage rain to keep the patio dry. Additional aesthetic features include draped fabric and powder coating to integrate the canopy components with the black steel structure. 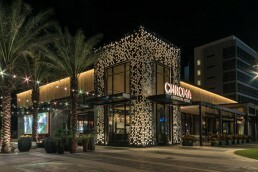 Now, with Chroma Modern Bar + Kitchen at the core of Lake Nona, big city flair and small town views is all the rave. 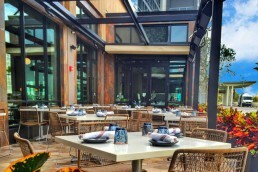 Serving guests a ‘modern American menu’ with ‘scratch-made dishes’, the entire concept, created by Tavistock Restaurant Collection, has cosmopolitan flair with small town sensibility.